With all of the drama of yesterday afternoon/evening, sleep for me last night was nearly non-existent with my mind continually running through the unfortunate events and also planning how today was going to pan out. With breakfast out of the way early, I met Julio downstairs and together we headed off to pick up the Police Report we filed for last night. Before picking it up, however, we had to go to some kind of specific bank to pay a tax charge. It's a tad unnerving just how many Police and security staff nonchalantly plod around this city with their fingers ever-caressing the trigger of large automatic weapons and shotguns, I have to say. Back at the Police Station, we were shown through to a cigarette smoke filled office belonging to a large, sweaty, balding detective who was bent over a keyboard, tapping out some kind of document at the rate of one key every 3-5 seconds. A pretty efficient operation indeed! With a bit of friendly Spanish banter from Julio, met with the odd grunt from the sweaty man, it became apparent that they had decided in their infinite wisdom to hold the Police Report for another 48 hours. This was NOT an option as we were leaving Lima in a matter of hours, so Julio leant over to me and softly suggested that I "tip" the sweaty man S20 (USD$7.25). This was obviously a bribe that was required here, so against every screaming moral fibre in my body, I flipped an S20 note on the desk and pushed it towards the sweaty man. Waddya know... he pocketed the S20 and my Police Report magically appeared. He stamped and signed it upon receiving my tax payment receipt and we were on our way with me swearing under my breath the whole way. At this point, Julio suggested we would have enough time to visit the Canon office he mentioned last night to see if we could get our hands on a replacement 7D for me. We both knew it wasn't going to be possible to find a camera that high end in a department store or mall, so it was at least worth a shot. We ended up catching a cab out to the edge of some nondescript freeway and were presented with a two-storey office building made up of black tinted glass, sitting behind a high concrete security wall. All we had available to us to try and get inside this fortress was a tiny intercom which Julio spent quite a bit of time trying to reach someone on. Eventually he did. 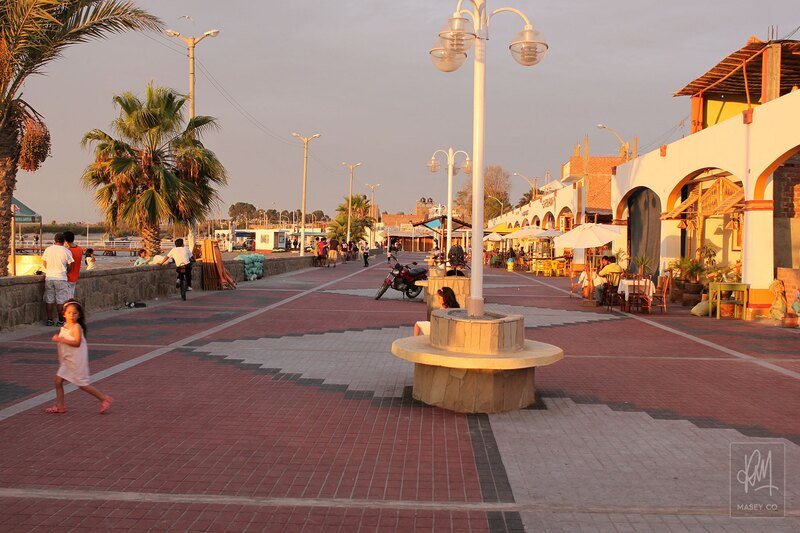 Interestingly enough, the first leg of our tour was to be completed via public bus – a 4 hour coastline journey south to the town of Pisco, home of the Pisco Sour. The bus was comfy enough for all and the scenery out my coastal side of the bus was interesting for the best part of the ride. Of note along the way was the condition of a majority of the residential houses which looked "ratty" and somewhat broken and/or unfinished. Julio explained to us that this was due to two different factors. Firstly, Pisco and surrounding towns were struck by a magnitude 8.0 earthquake back in 2007 and people are still rebuilding from that devastating event. And secondly, even when rebuilding, most residents choose to lay the foundations and piping etc for a second level on their properties without any real intention of building a second level. This gives the appearance of houses being unfinished and therefore helps the home owners avoid certain property taxes – a cosmetically ordinary but smart move on their part. On our way towards Pisco we made a stop at a Pisco winery in Ica. Here we were given an interesting tour of the traditional Pisco production equipment and facilities. For those of you not familiair with the spirit, Pisco is basically a strong, clear, white grape brandy that takes its name from the conical pottery in which it is aged. I wanted to take some photos of these unique pottery containers to show you all... but alas, no photographic tool at my disposal. The tour concluded with a tasting of the winery's full product range, so needless to say those of us who partook in the tasting were rolled back onto the bus which then carried us onto our hostel, Refugio Del Pirata, just a block off the beach in Paracas, a coastal town just south of Pisco. 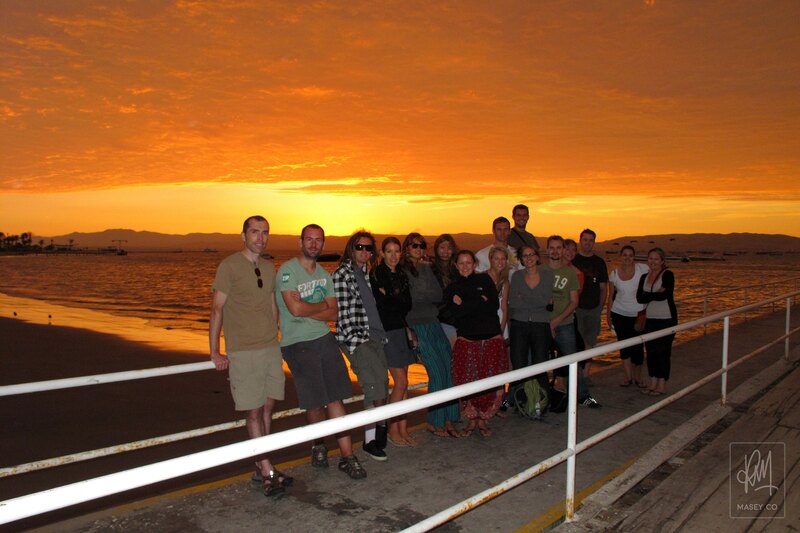 After being assigned our rooms and settling in, we all gathered back at the front of the hostel where Julio met us and led us on a brief tour down to the waterfront where we ended up catching a pretty impressive sunset, and selected a nice spot for dinner. Most of us had our first taste of a Pisco Sour and a bottle of the tasty local Peruvian Cusqueña Beer used to wash down a serve of the traditional Peruvian dish known as "Cebiche" which is basically fine white fish cooked with lemon juice. With dinner over and done with, those who wished to get an early night headed back to the hostel, while a large group of us returned to the same restaurant to grab another bottle of beer before bed. You'll have to remember while I'm going through these blog entries that every time I refer to a "bottle" of beer while down here in Peru, it's probably going to mean a 1 litre bottle. Crazy, I know. The impromptu nightcap was a lot of fun and gave us the opportunity to get to know each other a bit better over a lot of laughs. A good experience for sure. A big cheers to my new mates Rob Warwood and Florian Liese for chipping in some photos for this entry! Thanks lads!